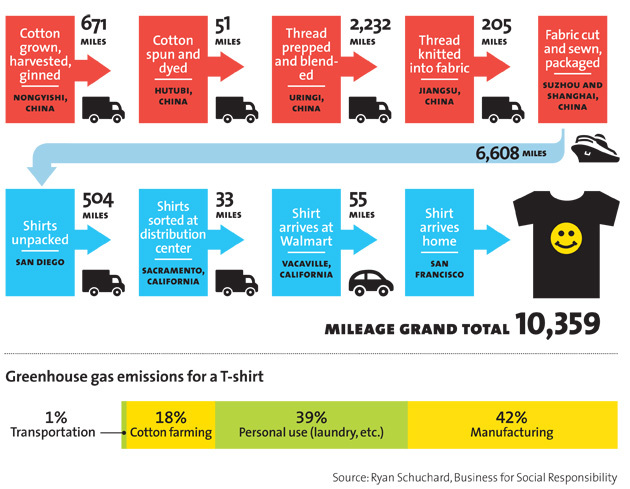 Your clothing’s long, strange trip from Chinese cotton field to big box to dresser drawer. This chart is part of Mother Jones‘ investigation into Walmart’s much-praised green makeover, for which reporter Andy Kroll traveled to China, the home of many of the retail giant’s manufacturers. He found that although Walmart claims to be monitoring its factories’ compliance with environmental and labor rules, its auditing system is plagued by corruption. What’s more, many factories outsource more than half their work to “shadow” factories—unregulated operations that auditors never visit at all. To read the full story, click here.